It was a very good day of junking. I found some lovely items, some to keep, some to sell - one large matt glaze aqua green vase by Pacific Pottery - a Sacramento, California company that has been out of business since the 1930's. Less than $9. It now has a home next to the Royal Haeger on my kitchen sill. 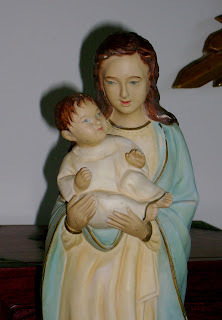 Another unique item I found was a large Madonna and Child Hakata doll from Japan. Hakata dolls are traditional pottery figures - typically idealized women, samurai, children or other brightly colored figures. During the Korean War, US servicemen brought them back, but the Japanese made specific styles for the gaigin market. So, the colors of the 'souvenir' dolls are less vibrant but more realistic. Although the 's-curve' pose is typical of a Madonna/Child figure, this has some unique characteristics. There's no veil on Mary, nor is there an indication of a halo. She's wearing shoes. The faces are Japanese, although the wavy hair and blue green eyes are certainly western. Japanese goddesses are often portrayed with long, loose hair, so this could be a nod to that in a very subtle way. Although some of the paint on the robe has rubbed off, it's quite lovely, with a very skilled painting technique, especially on the faces. Under five bucks. Oh, and two bakelite bangles for $2. Lucky day. Several other found items are now in my booth at Memory Lane. I keep the best ones for me.